The shift toward Direct-to-Consumer sales via e-commerce has had massive impacts on supply chain logistics. As highlighted in the table below the traditional retail supply chain is a fairly closed-loop ecosystem with standard, repeatable procedures on large batches of like items. By contrast the e-commerce supply chain is often more like a bowl of spaghetti where every noodle has its own unique path and curvature. E-commerce supply chain shipments are small with a nearly limitless set of endpoints. This involves significantly more touch points with more human interaction and a high degree of product variability. And, if that weren’t enough, consumers are continually demanding faster order completion without wanting to pay for it. According to DHL’s eCommerce VP of Strategy and Product Management, the average time from click-to-doorstep was over 6 days in 2014, decreasing to between 3-4 days in 2016, and is now likely closer to 2 days. For private equity acquisitions of distribution businesses with between $1.5-30.0mm in EBITDA, multiples continue to rise slightly on the whole (~1% growth from 2016 to the 15 months between the start of 2017 through Q1 2018). However, digging into the data reveals that multiples did not change consistently among various cross sections of targeted companies based on size. For instance, for distribution companies with $1.5-4.0mm of EBITDA, multiples rose 6%, for those with $4.0-7.5mm of EBITDA, multiples dropped 7%, and for those with $7.5-12.0mm of EBITDA, multiples rose 22%. While some of this fluctuation can be attributed to relatively small sample sizes, SDR believes that the data may reflect important M&A dynamics. For one, competition at the low end of the lower-middle market ($1.5-4.0mm of EBITDA) has become nearly as heated as for slightly larger business ($4.0-7.0mm of EBITDA). This can be attributed in great degree to two driving factors. The first is the rise of independent sponsors looking for smaller deals that committed funds may have more difficulty underwriting as platform acquisitions. Distribution businesses can be especially attractive targets to independent sponsors because of their typically low customer concentrations, fairly easy to understand business models and the fact that they can be ripe for efficiency gains with relatively minor investments in technology and marketing. With its acquisition of AJR Transportation on January 10, GlobalTranz completed its fifth acquisition in exactly one year’s time, adding an estimated 300 employees cumulatively. GlobalTranz received a $40 million growth equity co-investment from Providence Equity and Susquehanna Growth Equity in 2014 in order to spur on this acquisition spree. GlobalTranz’s GTZconnect technology platform uses machine learning to match shipper demand with carrier capacity. By rolling up freight brokerage firms, GlobalTranz is able to bring its supply chain technology into more geographies and into additional specialized freight needs (i.e., temperature-controlled and expedited services). By adding the data from the acquired companies into its existing data sets, GlobalTranz can also better train its models to increase predictive accuracy. The proliferation of online shopping and, conversely, the struggles of the retail sector, place an emphasis on direct-to-consumer sales and last-mile delivery. This creates huge opportunities for 3PLs to provide additional warehousing and delivery services. Conversely, the resulting struggles of the retail sector have had the effect of reducing the need for non-value add distribution. Additionally, e-commerce purchasing has had the effect of extending credit terms and creating pricing transparency, which has hampered distributor margins. The concept of the circular supply chain addresses the interaction between the forward and reverse supply chain. The majority of product companies spend most of their time focused on the forward supply chain. Some companies spend quality time really thinking about their reverse supply chain – the process of receiving returned or decommissioned product back. However, more companies are starting to realize the benefits of thinking holistically about their supply chain. According to a recent report by Accenture, although 92% of companies surveyed are geared up for product life extension, only 30-40% have implemented programs and initiatives to address it. The circular supply chain is really about the process of integrating returned product or parts back into the forward supply chain as new revenue opportunities in the secondary (or tertiary) market. For much of the consumer product space, the company that takes custody of the returned product is not the OEM. However, for industrial and other business-to-business asset returns, many OEMs like to regain possession and control of their product. Caterpillar is an industrial-focused company that has truly embraced remanufacturing. With nearly 65% of its costs generated by materials, Caterpillar has embraced remanufacturing through its Cat Reman program that incentivizes its customers to return used parts by sharing in the savings. Running an effective circular supply chain typically requires a much greater degree of flexibility than the original forward supply chain. For returned product, the condition and age of the assets will determine their disposition. For instance, the right decision for the next life of a particular returned product spans a spectrum from traditional disposal, green disposal, stripping the product for parts, refurbishment, rework, reengineering and remanufacturing. Temperature-controlled supply chain, or cold chain logistics, is fundamental to ensuring the safety and quality of products in the perishable foods and pharmaceutical industries, and to a lesser extent the electronics market. This segment of the logistics market has always been challenging given its strict temperature specifications and expense for capital equipment and energy requirements. While food constitutes the majority of the volume in the cold chain, pharmaceuticals necessitate tight controls throughout the chain of custody to maintain efficacy of expensive products. The pharmaceutical space faces logistics challenges including reducing security threats and counterfeiting as well as mounting regulation regarding serialization. Key priorities in the pharma supply chain are increasing end-to-end visibility, traceability and temperature control. According to the 2017 Biopharma Cold Chain Sourcebook, the global pharmaceutical industry is huge, estimated at over $1 trillion, and the industry is expected to grow even more due to changes in demographics and increasing consumer demand. By 2020, pharmaceutical cold chain logistics will likely grow by 65% due to the growth of biologically based products and vaccines, which require cold chain handling. Cold chain logistics has met regulation requirements by using data logging of temperature and humidity at certain intervals. However, maximizing safety and efficacy of products requires continuous monitoring from manufacturing through distribution and warehousing. Technology in cold chain is accelerating and becoming more sophisticated, even as costs come down, as new products and tracking are becoming the industry standard. The cold chain is transitioning to a real-time, actively managed process that utilizes sensors, probes, monitoring devices and different packaging materials depending on the season or geography to account for temperature variation. The adoption of new technologies will allow logistics providers the wherewithal to intervene to keep shipments safe and on-time and respond faster to any quality issues that are detected. Globalization, increasing regulations and the growth of temperature-controlled products as a percentage of the market, as well as heightened security concerns around theft and counterfeit goods, are spurring these changes. Over the past several years, air freight and logistics providers have made substantial investments in capacity for healthcare products, through new dedicated cold chain facilities and acquisitions of 3PLs that specialize in the sector. 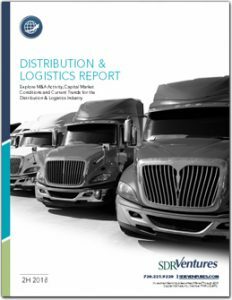 A note to our readers: Since we view the integrated supply chain as a whole, we have decided to combine our Specialty Distribution and Logistics quarterly reports. 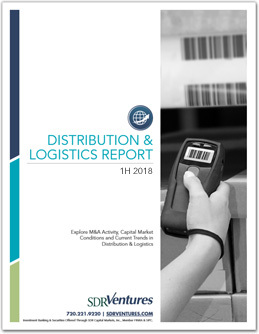 Transaction activity, transactions by location and active buyers now can be viewed on a combined basis, but our distribution and logistics public baskets (starting on page 5) are still broken out by industry to provide clarity. It’s no surprise that technology is playing a bigger role in the supply chain. As one of the more inefficient markets, which is facing margin erosion and severe talent constraints, huge opportunities are attracting the interest of new market players. Technology can drive efficiency, improve safety and decrease costs. New technologies are changing the way trucks are being deployed – through methods such as real-time infrastructure data, autonomous vehicle technology and the ability to efficiently match shippers and carriers via freight-hauling apps. Soon, these technologies could be keeping our roads safer too. In late 2016, the U.S. Department of Transportation proposed a rule initially requiring connected vehicle-to-vehicle (V2V) communication technology on light-duty vehicles, such as cars, through standardized messaging across the industry. V2V communication would include crash-avoidance applications that could have a significant impact on the number of vehicle crashes. The National Highway Traffic Safety Administration (NHTSA) also is considering action on vehicle-to-infrastructure (V2I) communications, integrating vehicles with traffic lights, work zones and stop signs. These technologies would enable vehicles to know where they are in relation to other vehicles and in relation to their environment. We expect transactions related to the use of technology in logistics to continue to accelerate. Shippers and transportation companies are using acquisitions to add to their tech abilities. At the same time, many new market players are viewing an eventual acquisition as an exit strategy, thus becoming willing takeover targets. While certain specialty distribution sectors, such as electronics distribution, are dominated by large players, the chemical distribution sector is in the early stages of consolidation and has a long way to go. According to Robert Mosel, senior vice president at Brenntag, the top worldwide chemical distributor, “It is still a highly fragmented market with huge opportunities for consolidation.” Only five years ago, there were no publicly traded chemical distributors. Today there are four. However, the decline in crude oil prices has driven down chemical prices, creating difficulty for companies to grow aggressively organically. Instead, they have been turning to acquisitions to drive growth. 10/13/16 – Lubricants business of NOCO Inc. in northeast U.S.
Like Mosel, we expect acquisitions to continue in this highly fragmented sector. Building supply distribution is another segment demonstrating strong M&A activity. Beacon Roofing Supply had third quarter sales of over $1B for the first time ever, with 60% of the increase due primarily to acquisitions. In the fourth quarter, ABC Supply finalized its acquisition of L&W Supply from USG (US Gypsum) for $670MM, combining two of the largest building material distributors in the U.S., and announced the acquisitions of Trumbull Vinyl Products and Ace Aluminum Distributors. As of November 1, 2016, ABC Supply had annual sales of over $8B and more than 700 locations in 49 states, increasing from less than $6B in sales for 2015. SRS Distribution, which has been backed by Berkshire Partners since 2013, grew to $1B revenues in six years and actively used available cash to make purchases while the market was down. SRS’s 2016 transactions included Metro Roofing Supplies, Tri State Aluminum Products, MidSouth Building Supply, National Building & Roofing Supplies, Monroe Aluminum Products and Atlantic Roofing Distributors. The company has indicated that it continues to make acquisitions a high priority while it grows organically and through greenfielding. Both logistics companies and their customers are facing significant competitive pressures from a variety of angles, and are using innovative means to succeed. Shippers are under intense pressure to provide ever faster delivery, at lower costs (or no added costs) to their end customers, while enabling their customers to track every aspect of the delivery process. As Amazon has become the trend-setter in the logistics space and affected nearly every facet of the sector, customers and shippers now expect “Amazon-like” delivery. In response, logistics providers have had to up their games. Shippers are becoming more confident relying on 3PLs for strategic initiatives. According to the 21st annual Third Party Logistics study conducted by Capgemini, Penn State University and Penske Logistics, a vast majority of shippers agree that 3PLs have helped them reduce expenses and improve customer service, and many reported that they have outsourced numerous transactional and operational activities to these providers. As a result, partnerships between shippers and 3PLs continue to become more strategic. Shippers have increased expectations when it comes to technology and services capabilities, and 3PLs are now offering more advanced analytics to help shippers better serve their customers. This confidence also comes through on the use of expedited service. Initially, logistics providers felt compelled to offer expedited service as a response to Amazon Prime and customers’ expectations for fast and free delivery to the home. This soon extended to oversized packages and B2B customers. As logistics providers develop the abilities to efficiently and cost-effectively provide these services, manufacturers and shippers have incorporated expedited delivery into their supply chains, making it a key aspect for managing expenses. 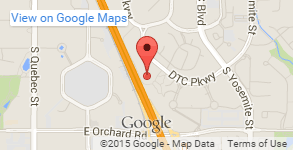 No longer is expedited delivery only for urgent or perishable items. Shippers are relying on it to keep inventory lower, help reduce warehousing costs, enable more flexibility in the production planning process, and prepare for market uncertainty. Omnichannel sales are making the leap from retail consumers to B2B buyers. With this trend, distributors are starting to prepare for an acceleration in online purchases. Consumers will have more access to information and improved processes through e-commerce and mobile apps, while companies will be able to use the technology and data for supply-chain optimization, operational efficiency and data analytics. Forrester Research estimates that online B2B sales grew from $559 billion in 2013 to approximately $780 billion in 2015, which represents nearly 40% growth in two years, and online sales are expected to surpass $1.1 trillion by 2020. Watsco, one of the largest HVAC distributors in the U.S., has stated a long-term goal to operate the most innovative suite of technology in the industry. Watsco has built a digitalized catalog of over 300,000 SKUs and mobile apps, and has utilized technology to improve inventory turns, reduce infrastructure costs and optimize fulfillment. In addition to enterprise computing and e-commerce, the Internet of Things (IoT) is growing in the distribution sector. The number of IoT-connected devices is expected to surpass 50 billion by 2020. IoT can assist distributors in increasing the quality of their relationships with customers by, for example, embedding sensors in equipment to better understand customer usage. Avnet certainly seems to buy in to this growth in IoT. The company divested its technology solutions operation group (to Tech Data Corporation) to renew its focus on components in new technologies, including IoT. The technology solutions group comprised nearly 40% of Avnet’s revenues in FY 2016, indicating a huge bet on new technologies and a willingness to potentially give up its spot as the number one electronics distributor to Arrow Electronics as it focuses on future strategy. In Q3, several large companies experienced top line softness, leading to less specialty distribution M&A activity. However, transaction activity remained strong in the electrical distribution space. Several large strategic companies made acquisitions, primarily to increase geographic presence. North Dakota-based Border States Electrical acquired Shealy Electrical wholesalers in order to enter new geographic areas in the southeast U.S. Graybar, an employee-owned St. Louis-based distributor of electrical, communications and data-networking products and provider of related supply-chain management and logistics services, acquired Cape Electrical Supply, which distributes electrical wholesale products to commercial, residential and industrial markets and assists those markets with on-site management. The acquisition complements Graybar’s branch network by filling in locations that were not previously served. In early September, after losing money for years, the bankruptcy of Hanjin Shipping Co. left almost 50 ships stranded at sea as no ports would allow the ships to enter without being able to pay docking fees. South Korea-based Hanjin, the seventh-largest container shipping company in the world, had been transporting over 100 million tons of cargo per year. The Company was saddled with $5 billion of debt as of 2015. Since the recession in 2008, global trade has been down, while container lines have continued to build more, larger ships. This overcapacity, estimated at over 30%, led to rates so low earlier this year that, by some estimates, Hanjin couldn’t cover its costs. When the Hanjin bankruptcy was announced, the price of shipping a 40-foot container from China to the U.S. jumped up 50 percent in a single day. However, given the overcapacity, rates are falling back to those depressed levels from earlier this summer. The fallout for U.S. companies was a service interruption for $14 billion worth of cargo that was stuck in transit when the bankruptcy was declared. This created higher initial shipping costs as retailers tried to get goods to market for the holiday season. However, this interruption certainly was not as severe as last year’s West Coast port strikes, and due to overcapacity in industry, competitors will quickly fill in. More large items and over-dimensional products shipping direct to consumers instead of typical retail channels. New online sales events, such as the second Amazon Prime Day and Wal-Mart’s response with free shipping and other deals. More complexity and higher demand for specific delivery windows and additional service days, such as Sundays. 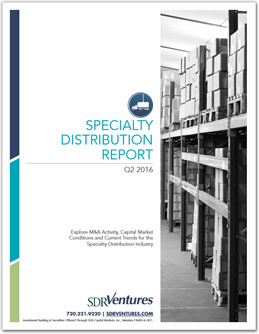 This quarter we are pleased to introduce our Specialty Distribution Report to our line of quarterly industry reports. It is imperative for companies to make long-term investments in distribution infrastructure, so we will aim to keep you up-to-date on the latest M&A activity and trends in this space. Specialty Distribution long has been dominated by extremely fragmented, distinct industry segments, making it difficult for players to grow organically. Companies that have found success focus on vertical differentiation and creating and maintaining efficient operations. Larger companies have turned toward acquisitions to add the industry segment expertise of smaller niche companies to drive growth. Within the middle market, successful firms generally are focused on being the best in their individual categories and/or regions. Smaller players can thrive in their respective market segments with superior customer service. Through acquisitions, larger companies with scalable platforms can leverage their infrastructure and technologies and apply the framework and resources needed to benefit from cost synergies and from the market experience of smaller niche players. In order to succeed in a market that is reliant on macroeconomic trends, companies can focus on the tangible elements that are within their control, such as optimizing operations and implementing the necessary infrastructure for scalable digitized growth. The Logistics industry has benefited from current market trends in digital commerce and online sales, as E-commerce revenue was up 8% over the last year, and mobile shopping (on phones and tablets) accounted for 31% of online shopping, up from 27% in May 2015. These trends have had a positive impact on the Warehousing & Storage and Software sectors specifically. In Q1 2016, the U.S. industrial vacancy plummeted to 6.4%, its lowest level since 2000, just before the onset of the 2001 recession. These low vacancy rates and the continued growth of online sales have raised the demand for warehouse space. Logistics providers are attempting to meet this growing demand by building mega warehouses of over 1 million square feet throughout the U.S. (but mostly concentrated in the South.) The construction of mega warehouses has proved to be a viable source for job creation, as warehouse jobs are one of the fastest growing areas of employment. We also are seeing investments in warehouse management systems (especially in light of larger, higher occupancy warehouses), transportation management systems and automation software. While companies are being cautious about economic growth, retail commerce is becoming more complex. Therefore to remain competitive, companies are finding it necessary to make long-term, multiyear investments to manage multiple brands, multiple locations and mobile solutions within both stores and distribution centers. An interesting development to watch is the newly opened larger locks of the Panama Canal. In anticipation of the new locks, changes already have been made on rail and road connections to docks, expansion of terminals, deepening of harbors and the purchase of larger replacement ships. Yet we are seeing a slowdown in trans-Pacific traffic with several routes eliminated prior to peak shipping season and postponing of peak season surcharges. Many experts expect a continued shift of imports coming from Asia to East Coast and Gulf Coast ports instead of the West Coast, a move that had begun to develop during the West Coast port shutdown due to union contract negotiations. We will continue to keep a close eye on the effects of these actions on U.S. logistics. The Logistics industry is off to a strong start in 2016 after a difficult 2015. The public basket tracked by SDR realized a quarterly increase of 5.4%. Although M&A activity for the sector has dropped 63.4% on a year-over-year basis, we are expecting this to reverse in upcoming quarters. The Air Freight segment, for example, is well positioned for future M&A activity. Air Freight has accounted for a great number of deals in past years and recently has benefited from the West Coast port stoppage, when companies sought to deliver products through different channels. As companies have worked through the inventory backlog from the West Coast port shutdown, the growth in demand for Air Freight has returned to its previous pace. On the other hand, while Marine Transportation should be enjoying the benefits of the West Coast port reopening, instead idle container ships are at a six-year high due to increased efficiencies and a general slowdown in global trade. Additionally, many manufacturers still are worried about future stoppages at the ports. In fact, business and retail groups have asked the International Longshore and Warehouse Union and Pacific Maritime Association to extend the recently agreed term of the contract with the West Coast ports in order to avoid future work delays. However, Marine Transportation may be aided by the opening of the new Panama Canal locks on June 26, because the Panama Canal provides a more direct route for some destinations and an alternate route in case of stoppages. Another trend that we are following is the increased usage of 3PL (third-party logistics) providers by smaller e-commerce merchants to connect with customers as an alternative to in-house fulfillment. E-commerce generates 11.9% of North American 3PL revenue but is expected to increase to 20.9% in the next three years, according to a CEO survey conducted by Logistics Management. Jeffrey Graves, President of Sedlak Management Consultants, stated, “For dynamic e-commerce picking, highly automated robotic and shuttle-based systems provide accurate and rapid goods-to-person solutions. These systems can achieve performance levels of many hundreds of order lines per hour with precision accuracy.” Due to stiffened competition, many 3PLs are transitioning to 4PLs (fourth-party logistics) by offering additional services. 4PL providers use advanced management and racking systems, and often offer additional services including complete marketing campaigns that allow customers the ability to sell and market their products online and internationally. A significant disruptor in the space may be taking hold, as e-commerce giant Amazon is continuing to make moves to significantly increase its Logistics presence. Amazon’s significant use of robotics and analytics in its warehouses and its recent financial investments in delivery channels make it more competitive. Logistics companies are expected to respond by investing internally or acquiring companies that would provide them the capabilities to compete successfully. As such, M&A activity should heat up in the coming quarters. Entering 2016, the Logistics Industry continues to exercise caution as recent reports suggest that the global economic rebound is decelerating. Inventories are high in both the retail and industrial segments of the supply chain, and weak exports and low domestic factory production have stemmed from a strong dollar. These factors, intensified by a slowing Chinese economy, resulted in a flat 2015 performance for the industry and an uncertain 2016 outlook. “Supply and demand are so closely matched right now, there’s no room in the industry for one glitch. It sends everything into a tailspin. The West Coast ports proved that,” according to Candace Holowicki, director of global transportation and logistics for TriMas Corp. However, there is some optimism as we enter 2016. The industry has responded to these economic headwinds by improving operations; excessive inventories have been trimmed and new orders have been reduced. 2015’s inventory hangover on the West Coast ports stemming from the International Longshore and Warehouse Union strike has been resolved. The strike resulted in depressed demand for new orders and freight shipments through Q3, affecting the entire industry. The West Coast ports should return to higher productivity in 2016 as shippers work through inventories and demand normalizes. Finally, the expected 2015 driver capacity crunch never fully materialized. Trucking companies have successfully avoided the crunch by proactively increasing pay for truckers and Congress’ easing of the 34-hour restart rule has improved driver utilization. The Logistics Industry has responded with mixed sentiments to Congress’s $305-billion FAST Act. Feeling the weight of a struggling infrastructure, in December Congress and the President passed the bill that included funding for U.S. highways and mass-transit projects. It is the first long-term law in over 10 years after 36 short-term extensions. One of the main accomplishments of the FAST Act is the creation of new programs concentrating on improving freight corridors, reducing major traffic chokepoints and decreasing delivery time. The bill calls for an additional 14,000 miles to be added to the national freight network, increasing total infrastructure miles to 41,000. While most industry insiders have lauded the FAST Act, some provisions within the bill have drawn criticism, including Congress’s rejection of allowing 33-foot trailers on the highways. Fred Smith, CEO of FedEx, recently addressed this concern, noting that these trailers would eliminate an estimated 6.6 million trips per year, reducing congestion and traffic accidents. It would also help save over 200 million gallons of diesel and reduce carbon emission by 4.4 billion pounds per year. M&A activity within the industry will likely remain high in 2016. According to the Trucking Industry Defense Association, 45.5% of logistics providers believe that consolidation is helpful in such a fragmented industry. Furthermore, a survey conducted with logistics executives revealed that 69% believed millennials will change the way supply chains are managed with the rise of e-commerce and software developments. M&A is likely to stay on pace with 2015 as shippers indicated a preference of acquiring companies that meet these trends, as well as the rise of full-service logistics providers. As world population and consumer demand increase, the Logistics Sector continues to feel added pressure to scale operations. The Trucking Industry driver shortage has proven challenging with the growing rise of freight demand. Earlier projections in 2015 estimated a shortage of 35,000 drivers. Within the next five years, that shortage is expected to eclipse over 240,000 drivers. Trucking companies have found creative solutions to overcome the shortage. For example, opting to add more trailers per truckload provides a solution that not only increases overall capacity per driver, but also improves overall productivity and efficiency. This increase allows companies to prepare additional trailers for pick up once drivers have executed their orders. Companies are also utilizing route optimization which reduces mileage, fuel costs and overall time spent on the road. The Marine Freight Industry has also been impacted by headwinds. The American Association of Port Authorities reports that US ports project investing $46B by 2017. This need for capital will result in a rise in capital-formation activity as ports seek ways to raise funds. In Q1 of this year, additional pressures came to a head on the West Coast ports over pay disagreements between management and the International Longshoremen and Warehouse Union. These disputes materialized as the ports had been facing increased work traffic. Overcapacity and infrastructure shortfalls were increasingly apparent due to the ongoing growth in TEU (twenty-foot equivalent unit) sizes. From first half of 2014 to first half of 2015, West Coast port activity slipped from 55 to 50 percent due to the shutdown. The entire West Coast ports represent a staggering 43 percent of all US trade. Companies with strong balance sheets are well positioned to take advantage of industry weaknesses. With the dollar gaining strength on the Euro, Yen and other currencies, cross-border acquisitions will be cheaper as companies seek to expand their geographic capacity and long-term growth. Additionally, economies in emerging markets continue to see GDP growth and fast-growing populations. These factors will help drive future M&A activity in this industry. In Q2 2015, the logistics industry’s market cap contracted by 6%, significantly underperforming the S&P 500. Total trade value, manufacturing and retail demand, outsourcing and the price of crude oil drove industry movement down this quarter. Many commodities have been cut from shipments due to exporting prices and demand. However, the demand for the transportation of goods correlates with the increase in consumer spending, which will continue to rise as discretionary income continues to grow. As the transportation of goods increases, there will be a higher demand for logistics services resulting in an environment that is favorable for M&A activity. This quarter, the logistics industry recorded 38 transactions, which represents the highest number of Q2 transactions in the past five years. 19 of the total transactions occurred in the air freight and logistics segment because many companies in this segment are filling the need for efficient global shipping. The number of oil rigs in the United Sates increased to 859 in the last week of Q2, halting a 28-week decline. The increase in oil rigs will likely lead to growth in shipments of commodities, such as coal and grain. This rise correlates to the price of crude oil and as a result affects the expenses of shipping and logistics companies nationwide. There has also been a recent shortage of employees in the freighting industry due to baby boomer retirement and a lack of interest among millennials. These factors are contributing to the poor performance of the logistics industry. In Q1 of 2015, nearly two thirds of all M&A transactions were strategic purchases. This indicates an ongoing demand for logistics firms that provide vertically integrated logistics services due to their convenience and economies of scale. Growth in the sector continues to be driven by an improving economy and robust consumer spending, especially in online retail markets which have seen revenue increases of approximately 10% annually over the past five years. As total industry revenue is still recovering to prerecession highs, healthy manufacturing levels and growth in international trade will likely increase the demand for the transportation of goods leading to a surge in demand for industry services. Falling domestic unemployment rates and rising average income levels will provide growth opportunities for domestic logistic services firms. However, economic uncertainty internationally poses a potential threat to the industry. While there has been a post-recessionary trend of firms outsourcing logistics services to focus on core operations, some firms are keeping their business in-house. Amazon has recently been approved by the FAA to begin testing its drone delivery program in the US which has the potential to change the competitive landscape within the logistics industry. Although M&A transactions in air freight and logistics account for 25 of the 36 total transactions, air freight holds a small percentage of total freight transportation services. Many airlines are adopting the International Air Travel Association’s (IATA) new industry-wide initiative e-Cargo, which is aimed at reducing costs and improving operating efficiencies, positioning the air freight segment for growth in 2015. The logistics industry witnessed improved growth in Q4 2014 due to growing downstream demand and rising trade levels. Warehousing, freight, and logistic services remain largely tied to downstream manufacturing, wholesale, and retail markets. Rising disposable income, 4% growth in international trade, and increasing levels of outsourcing to the business services sector, since the recession, have boosted industry performance throughout 2014. In Q4 of 2014, the number of M&A transactions decreased from 36 to 30. Transactions in air freight and logistics led the industry accounting for 38% of total transactions. 63% of transactions were conducted by strategic buyers, and 57% of these buys were executed by UPS or FedEx, indicating a market trend towards the consolidation of smaller industry players. Though the number of transactions saw a slight decline, the demand for this select set of targets increased, as indicated by higher historic valuations. These valuations were driven by demand from strategic buyers and industry reports forecasting a 5% growth for 2015. Projections also lead to numerous private placements from firms looking to capture potential value from the industry’s forecasted growth. 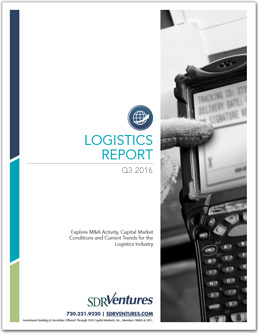 The pace of logistics M&A transactions slowed slightly during the third quarter, down from 24 total transactions to 20. Once again, transactions in air freight and logistics lead the way, accounting for 65% of total transactions. Although transaction volume in 2014 won’t set any industry records, deal multiples are reaching highs, a trend that has continued since the global recession. The general increase in equity market valuations has contributed to higher deal valuations, but transportation deals, which tend to carry above average multiples, remain some of the most popular in 2014. Two of the three “mega deals” announced this quarter were transportation related. M&A trends suggest that the logistics industry is taking steps to improve performance through consolidation within underperforming segments and in emerging markets. Acquirers have remained somewhat risk averse, as indicated by the overall pace of deals and the general local-market focus. There is, however, a decent amount of demand for a more select set of targets, as indicated by historic valuations. Going into the fourth quarter, it is likely that transactions in the air freight and logistics and transportation related segments will generate the most volume. Q2 2014 M&A activity in the logistics industry reflected the ongoing strategy disagreement among large operators: does the concept of agility mean logistics companies should restructure themselves to be asset-lean or does it mean they should focus on tech-enabled organizational structures that maximize asset utility?As some incumbents divested business segments, others happily acquired discounted assets with the intention of integrating them into their optimized models. New players to the industry, however, are almost exclusively building their business around tech enabled models, driving up valuations of public and private logistics software providers. The industry is confronting concerns surrounding high and volatile energy costs, increased regulation in carbon emissions and road use restrictions, and blurring lines between market segmentation (e.g., the re-emergence of rail as a cost effective F&L alternative for the automotive and agricultural industries). One of the premiere methods of confronting these concerns is through scale and integration; while deal volume in 1H 2014 beat the previous year’s, the most substantive story of Q2 is the ratio of strategic to financial buyers. With 92% of acquisitions deriving from strategic intentions, it is clear that managers are making plays to hedge against their industry’s headwinds. Q1 media coverage of the freight and logistics industry majors was less than favorable for much of the quarter. Perceived holiday season fumbles by United Parcel Service (NYSE: UPS) and FedEx (NYSE: FDX) were frequent targets for pundits, but the vast majority of the industry performed well over the past six months. Given the consistent (albeit slower than hoped for) pace of growth in US GDP, it’s no wonder that the transportation and logistics industry appears healthy. However, that is not to say that the industry is without imminent challenges. Recent industry polls show that more than three-quarters of F&L executives are worried about high and/or volatile energy costs, and over two-thirds are concerned about both over-regulation in carbon emission and road use restrictions. Also concerning is the growing product diversification in the railroad segment (see “Industry Segments” section) which threatens to steal market share from other overland freight segments. However, despite the macro challenges facing the industry, strong financial performance was apparent in Q1 and is expected to continue for the balance of 2014. Improved working capital on middle-market balance sheets are expected to lead to continued growth in M&A activity and capital formation as companies seek scale to combat these challenges. 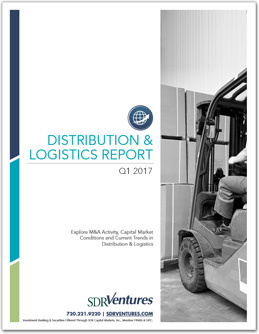 If you’d like to receive our next Logistics Report by email, please click here and select “Distribution & Logistics Report” from the list.